With Italy's new government once again - if coyly for the time being - bringing up the thorny issue of currency redenomination within the Eurozone, and by implication the failure of the euro and its reversion back to its constituent currencies, we thought it would be a good idea to remind readers why the euro exists in the first place. The briefest possible answer: to make sure the Deutsche Mark does not. 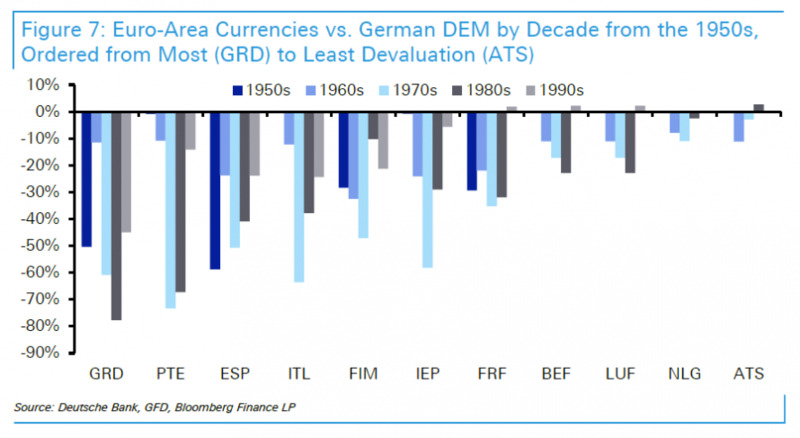 As presented in the chart below - which shows the performance for each of the EU12 countries against the German DEM in every decade from the 1950s to the start of the Euro in 1999 - apart from a small revaluation of core countries in the 1990s, every country devalued to Germany in every decade between the 1950s and the start of the Euro. 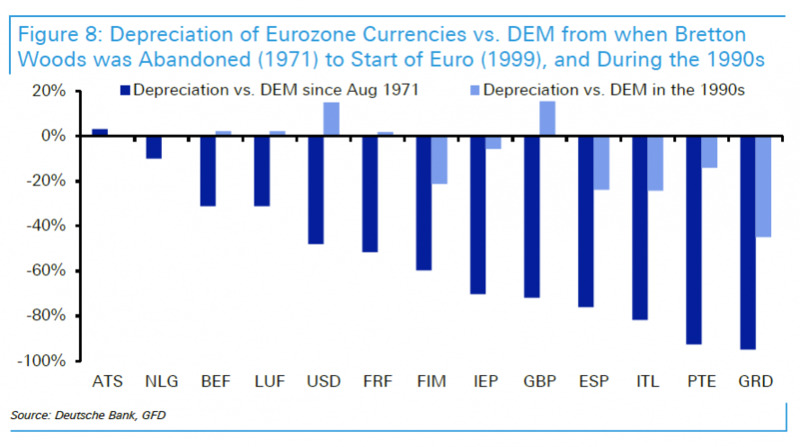 Said otherwise, the Deutsche Mark appreciated in value against all of its European peers for 5 consecutive decades, a condition which if left unchanged, would have led to an economic and trade crisis. Looking forward, Italy will not find it easy to grow out of its problems as its facing one of the worst set of demographics of the G20 countries. It’s population size has peaked (according to the UN) and is expected to decline out to 2050. Its working age population (15-64 year olds as a proxy) is set to fall -24% over the same period and is again one of the worst placed in the G20. One can almost see why Italy is rather angry at the Euro: As Reid summarizes, Italy is stuck in a "fixed exchange rate with one of the most competitive countries in the world in recent times. The debt levels, high levels of youth unemployment, and demographics show the difficulties that will lie ahead too"